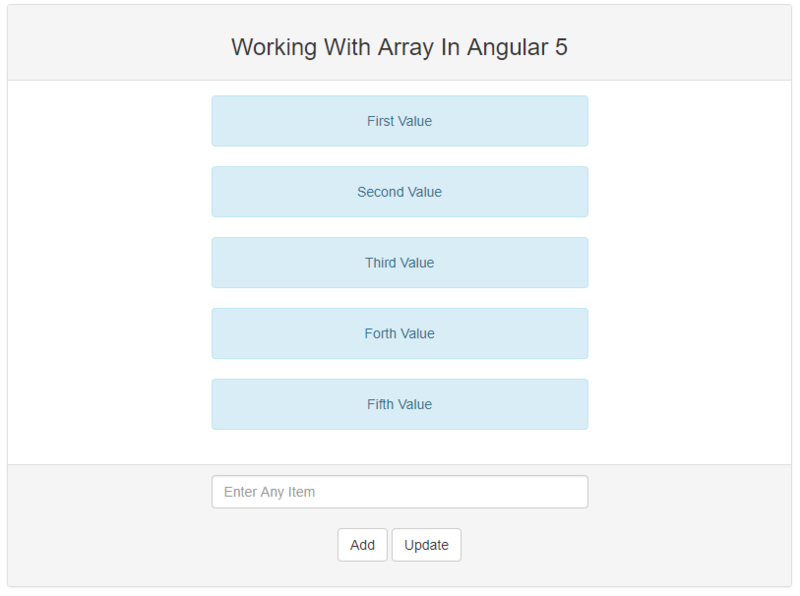 In this article, we are going to cover how to do CRUD operations using simple array using angular 5. In this article, on Angular, we are going to see how to do CRUD operations using an array in Angular 5. I found many articles showing CRUD operations with Angular in many different ways, but I chose a simple way to do the same task with an array so that beginners can create and learn simple methods for CRUD operations. An array is a great way to do CRUD operations without using any kind of storage. Let's start by implementing the demo step-by-step. Create an Angular 5 project by executing commands as described below. After completion of all the above steps, a new window will open in the browser and you can see the default output for the project. So far, we have created and executed an application with a predefined structure. It's time to customize files as per our CRUD operation requirements. <input id="Value" name="Value" required minlength="3" maxlength="15" style="width: 50%;" placeholder="Enter Any Item"
As you can see in the above screen, it contains a simple bootstrap panel with its header, body, and footer part with textbox and buttons. It's just a normal HTML page, with the form not working completely, soon we will make it dynamic. Now, we are going to start with CRUD operations with Array. I created a class named MyItems that is used to store items in an array. And also, created a myItems array that uses a class to add items to it. Here, I'm providing a few default items to my array. To print items of Array, we need to modify our app.component.html file. Here, I have used [ *ngFor = " " ] to print items of array, and if array will be empty than you can get message from Items that are empty by default. We have created Select operation for CRUD, now it's time to add a new record. 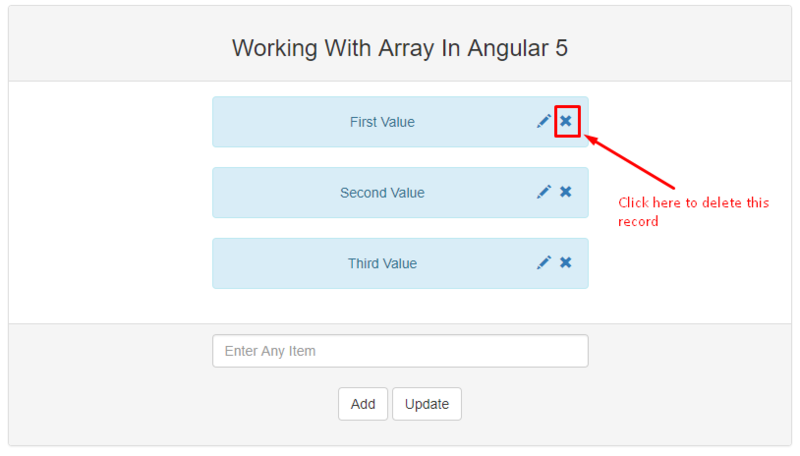 Let's implement the functionality to add a new item to the array, for that we are going to create a new method in a component class and binding click event in ADD button click event. Here, we are going to use two-way data binding with "newItem", which binds textbox value automatically . For that, within HTML, I'm going to use [(ngModel)]="" to work with two-way data binding. <input id="Value" name="Value" required [(ngModel)]="newItem.Value" minlength="3" maxlength="10" style="width: 50%;" placeholder="Enter Any Item"
As you can see, within ADD button (click)=" " event is bound to add new item into the array using component code with the value of [(ngModel)]="newItem.Value"
We added one item which shows inside panel-body, which lists down array items automatically when we modify any records or try to add new records. We have created functionality for SELECT and ADD new records, now, let' move to update operation in crud operations. We are going to modify record which we already added to the array, for that, I've added one method which takes a record that needs to be updated. For editing specific records, and after updating value, there are two separate methods that perform different functions. EditItem - Selects the specific user for the edit. UpdateItem - After modifying a record, we need to update value to the array. We need to bind this event to buttons so that we can get specific records and also can update them. For editing record, we need to select any record and for that, I've used two links with an icon and bound events, that we created previously. So, In this way we can update our record, the last step is to delete any record. After delete operation , you can see array item will be deleted. So far we have created all the operations for CRUD operations step-by-step. In this part of the Angular tutorial, we have seen a simple way to create a CRUD operation using an array. Keep in mind that it does not follow any coding standard, because its just a demonstration, you can modify this demo as per your requirement and can use coding proper standards. Download the attached project and try to execute by yourself, let me know if you face any issue. I hope you have learned something from this tutorial. Thanks for reading.